EFSA, the European Food Safety Authority, is the EU agency based in Parma, which provides scientific advice on risks, existing and emerging, associated with the food chain. In February 2012, EFSA published the quantities of reference intake for the population (PRI) referred to the protein, at the conclusion of work on the reference values ​​for diet (DRV). Adults (including the elderly): 0.83 g per kg of body weight per day. Infants, children and adolescents between 0.83 g and 1.31 g per kg of body weight per day, depending on age. Pregnant women: supplemental intake of 1 g, 9 g and 28 g per day respectively for the first, second and third quarters. Breastfeeding women: additional intake of 19 g per day in the first 6 months of lactation and 13 g per day thereafter. The PRI apply to diets with a protein mixture, that is, both animal and vegetable sources. To fix the PRI protein the Panel adopted the parameter of the nitrogen balance. Nitrogen balance is the difference between the nitrogen introduced through food and the amount of nitrogen lost from the body with the slag. In healthy adults the protein requirement is necessary to achieve a zero nitrogen balance (maintenance). The factorial method is used to calculate the protein requirement under physiological conditions such as growth, pregnancy, or breast-feeding. In these cases the nitrogen is necessary not only for the maintenance but also for the storage of proteins in the newly formed tissue and in milk. In children, the nitrogen balance must be positive in order to allow growth. 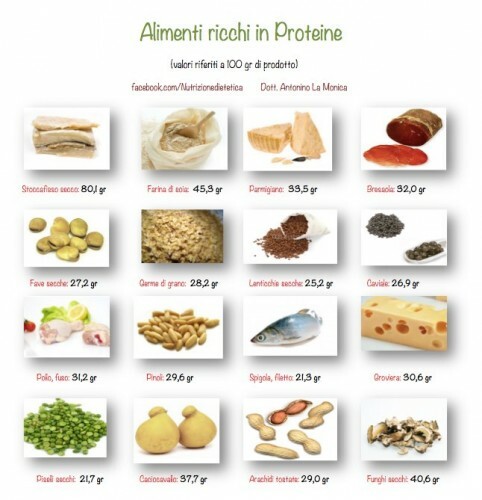 Experts believe that for all groups of the population protein intake in the European population is adequate. Comparing a number of national food consumption surveys, the average intake of protein among adults in Europe is often equal to or greater than a PRI of 0.83 g per kg of body weight per day (between 67 g and 114 g per day for men and between 59 g and 102 g per day for women). In particular, the main sources of protein in the diets of adult Europeans are meat and meat products, followed by cereals / cereal products and milk / dairy products. In the past, the group of experts have published studies that defined the DRV for carbohydrates, dietary fiber, fat and water. The DRV constitute the complete set of quantitative values, such as the average requirement, the reference intakes for the population, adequate intakes, consumption of reference intervals, the minimum and maximum levels of tolerable intake.